We appreciate your review, Adam. We are sorry this Avantco meat slicer is not able to be adjusted properly. Our Customer Solutions team is working on assisting you with this problem. This slicer didn't match up to the reputable brands that I have come to know. It's much lighter and built for lighter use. It arrived damaged but the great Customer Service department had it picked up and returned, and then credited immediately. I would not recommend this for heavy duty or daily use. I ended up purchasing a more expensive brand. I believe you get what you pay for. Thank you for the review! We’re sorry this did not work for what you needed it for, but we are glad we were able to help! We appreciate your review Jeff. We're sorry this unit was defective. We have received your return and credited your account. Meat slicer was so heavy as to be basically impossible to move. You have to almost completely disassemble it- remove screws, etc, to properly clean it. So basically it's nearly impossible to get really clean for food safety. Do not buy it- you will not be happy. We are sorry you did not prefer this meat slicer, for recommendations please contact our Customer Solutions team! We appreciate your review, Vasilios! A Customer Solutions Representative will be contacting you shortly. The meat slicer that we purchased I would not recommend. It cannot be taken apart easily to clean, you need a screwdriver, which is not convenient at all. 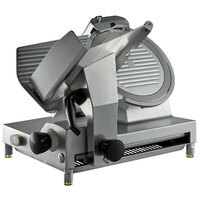 We had a meat slicer previous to this one that was a little more money, and I wish we would have bought that same one. Thanks for the review! We are sorry you do not find this slicer easy to clean. It’s a reliable machine, offered at an incomparable price, for those who are looking for a great value. For a machine that disassembles quickly without the aid of any tools, try Berkel 827A-PLUS 12" Manual Gravity Feed Meat Slicer instead! Thought this would be a reasonable slicers at a good price. This is NOT what you want if you will be using it a lot. It is poorly designed and HARD to clean. Spend the extra money on a nicer model if you plan on using it a lot. After using this slicer, I would gladly pay extra for a better designed and easier to clean machine. I will say that is does slice well, but it isn't worth the hassle of cleaning. Thank you for your review, Reid! We are sorry that you did not like this meat slicer. We recommend checking our Meat Slicers buying guide to help compare different options and find the one that will best suit your establishment. After several months of use we like the performance of this slicer for light duty applications. All things considered, cleaning is relatively easy. We would recommend this product. Solid slicing power even through cheese. Sliced for 2 hours straight with no issues. For a lower to mid price unit this does the job well. If slicing very large cuts like brisket or long cuts like genoa you will have to cut the meat in half. That is to be expected fro a slicer of this size. Slices great and is easy to use. I have not yet been able to figure out how to take the slicer deflector off to properly clean it. The instructions merely say to take it off to clean. They don't say how. I'm sure I"ll figure it out eventually. If the cleaning instructions were more helpful I'd give it 5 stars. One problem after another. handle just broke still waiting for them (avantco) to help me fix it, Why cant they call me back?impossible to clean, and you have to tighten the bolt constantly to make sure you don't get metal shavings in your meat or cheese because blade is always hitting the arm of the unit. Thank you for your review! A Customer Solutions Representative will be in contact shortly. We're working on sending a replacement handle for your slicer. Please see our Avantco Meat Slicer Demonstration video on the item's page for helpful tips and information regarding this slicer. this slicer is a great value for the price. its a great beginner slicer, gets the job done for a fraction of the cost. we love it thanks for the great value. For being a low priced meat slicer, we have had no issues with this model. We purchased in in June of last year for our new store when we brought deli meats in. Greatly cut down on our prep time (vs. hand sliced meats) and gave us a new avenue of sales. Recent acquisition for a serious home cook. I cure my own bacon amongst other items and wanted a slicer that would be up to the task. This definitely does that. I cold smoke my bacon, so would recommend chilling the bacon in the freezer for about 30-40 mins pre slicing. It then slices beautifully. I chose this option as I wanted a tray capacity for a reasonably sized rasher. Awesome slicer! We've had it for a month and it is so easy to use. We tuck a piece of wax paper underneath to catch the meat an fit works like a charm. Great buy! Fantastic buy at a price we were very happy with. Service is fantastic. Contact people were helpful and had good attitudes. Shipping was timely and they even helped unpackage our equipment. Avantco builds their slicers to serve the entry-level customer. Their affordability helps a great many folks get their business off the ground. For busier, established businesses, it may serve you well to step up to one of those premium brands. Our Meat Slicers Buying Guide is a great resource for choosing a slicer and our Slicer Cleaning Kit is a great set of tools to help you clean your slicer more easily. We been using this slicer for about seven months. A bearing went after a couple months in the table that slides back and forth, it still works fine. It just makes alittle noise.